I'm excited to have my first guest blogger here! Today's post comes from Regina at the Lake. I have been enjoying the creative how-tos she shares on her blog and I think these necklaces are just adorable. Once you're done here, head on over and check out her site! Thanks, Regina! Hi, I am Regina Partain, Owner and Innkeeper of Bridgeport Lake Bed and Breakfast on Lake Bridgeport, Texas. My passions abound and include wedding planning, sewing, crafting, quilting, jewelry making, and family, not necessarily in that order. The order changes frequently, I think, based on my current project, or more accurately, current projects. To me they just say ‘let’s have fun’. There is just something very playful about them. 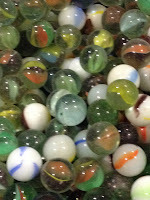 So, today we are going to make some jewelry with, of all things, marbles! 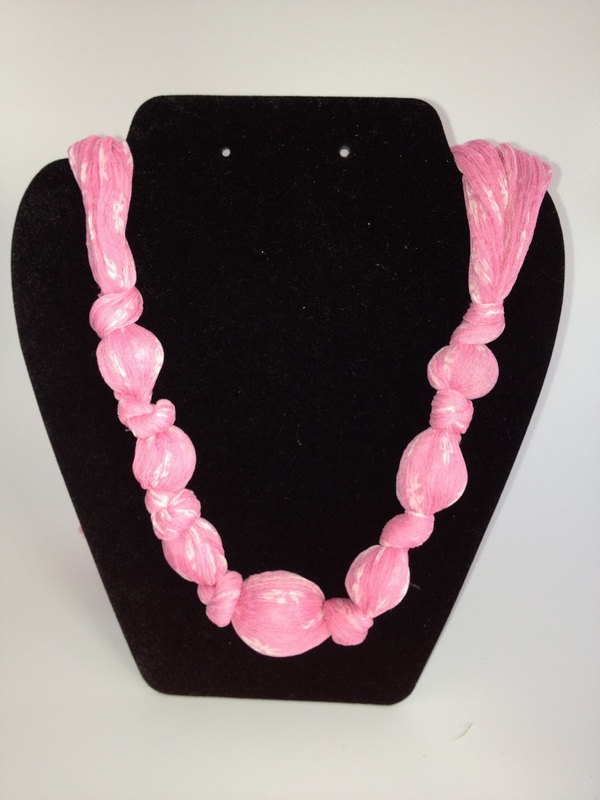 Here is a sample of a lovely necklace made with a pink scarf and marbles. One narrow, long scarf that you no longer wear. The narrower your scarf is, the better it will be as you begin to tie knots. 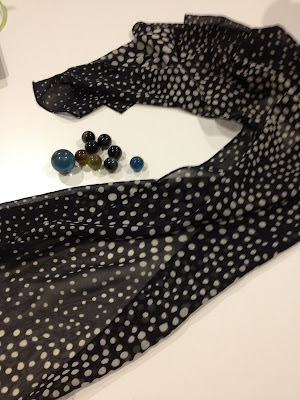 For this scarf I used 3 large marbles (approximately 1” across), but for the pink one shown above (which was a longer and narrower scarf, I used 1 large marble and 8 regular marbles). So, you will have to make the decision on size and quantity of marbles based upon your scarf. Depending upon the length of your scarf, you may need a button, needle and thread. 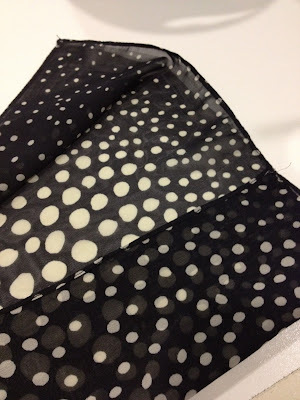 The scarf needs to be wide enough to wrap around the marble without the color showing through. That’s it. That is all you need. Try to stick with marbles close in color to the scarf so that the color of the marbles doesn’t show through. The picture shows 9 marbles, but I replaced the 8 smaller ones with 2 more large ones. 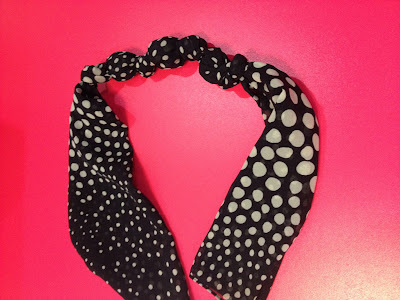 Find the center of your scarf by folding it in half lengthwise and marking the fold. 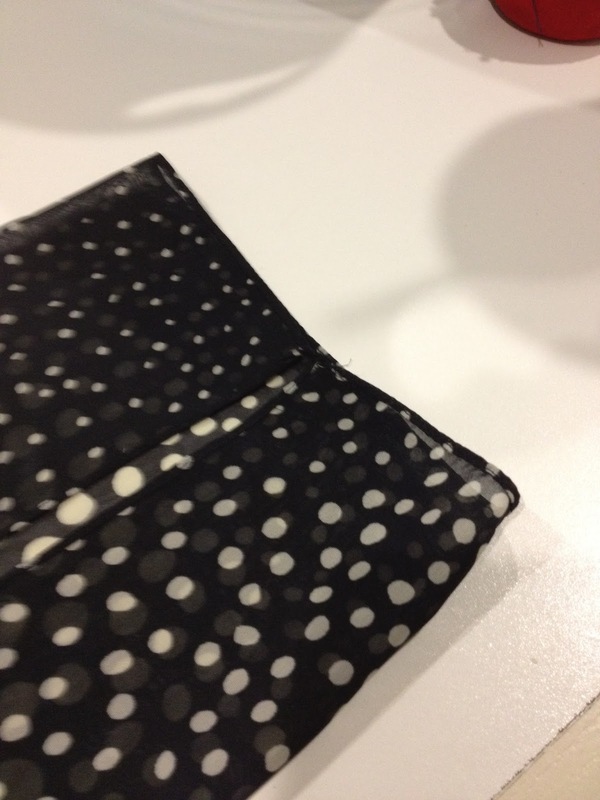 Then fold the long edges in to the center. Continue folding to the center until your scarf is approximately 5” wide. A little more or less won’t hurt. Place your large marble at the center of the scarf. Now, this is the hardest part. 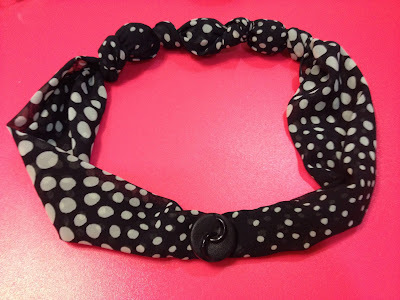 Wrap the scarf around the marble while still keeping it relatively in the center of the scarf. Wrap it tightly. Placing a straight pin on one side of the marble, while you work on the other side, helps keep it centered. Twist the scarf into a slender piece that you can tie a knot in. Tie the knot and pull it as tightly as you can, getting it as close to the marble as possible. Now, remove the pin on the other side, and tie a knot there as well. Here is what it looks like with the first 2 knots. It is kind of hard to see in this picture but look closely and you can see the marble in the middle with a knot on either side. Now, begin adding marbles to both sides. Slide the marble into the opening next to the knot you have tied. 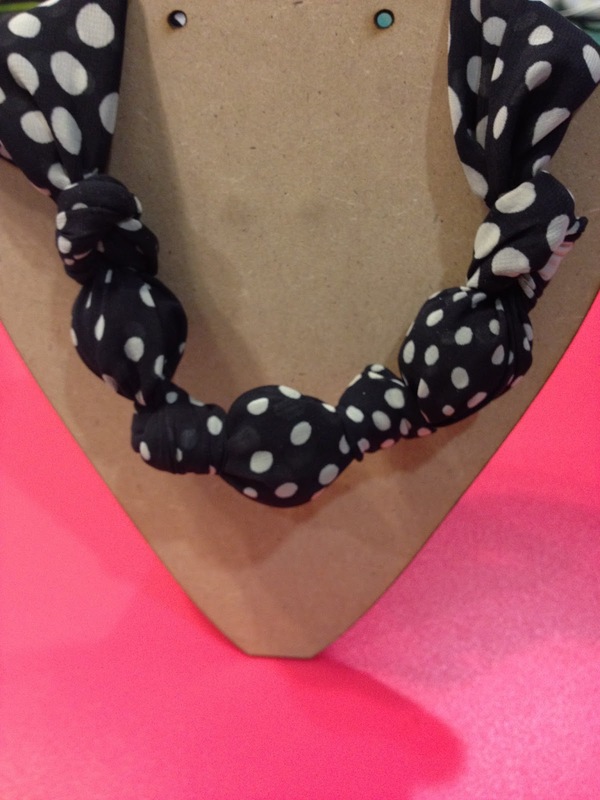 Twist the scarf tightly around the marble and then tie a knot. Add 1 marble to one side and tie the knot, then move to the other side and do the same thing. Work your way up through the 8 regular marbles, 4 to each side. Well, the scarf I used this time was not nearly as long as the pink one in the other pictures, so I had to ‘punt’. I only used 3 marbles, and then I gathered the ends of the scarf together and sewed a button on to anchor it and close the opening, after first making sure it would fit over my head. 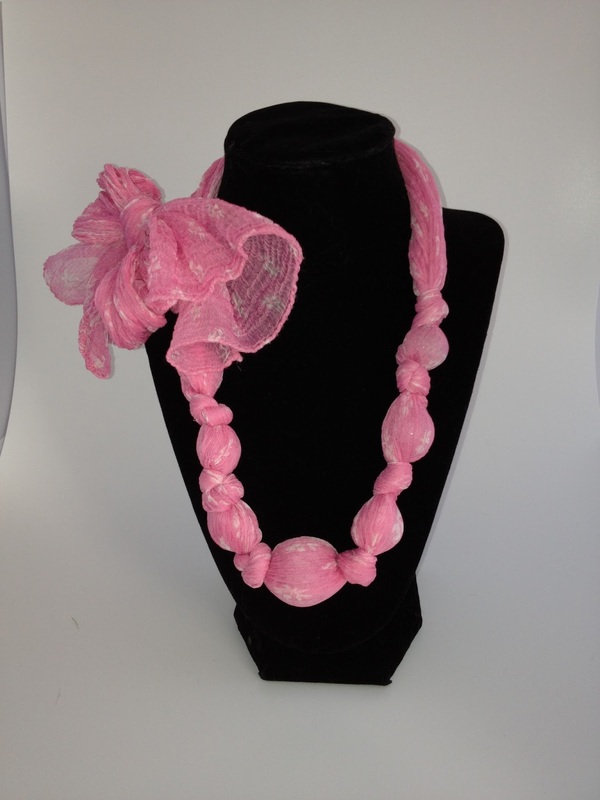 On the original pink necklace I simply tied a bow in the ends of the ribbon after first deciding if I wanted the bow in the back or on the side. I would love to see what you make with a scarf and marbles. Have fun! Stephanie, thanks so much for having me as your guest blogger. I am so happy to be your first! This was fun to do. I hope your readers like it. You're welcome and thank you for such a nice tutorial and great photos! This was new to me too. They sure are elegant and pretty! So cute! Pinning it to try out! This is so clever I would have never thought to do something like this. Pinning! I am in love! So simple and elegant!! She did a great job! I love it too!